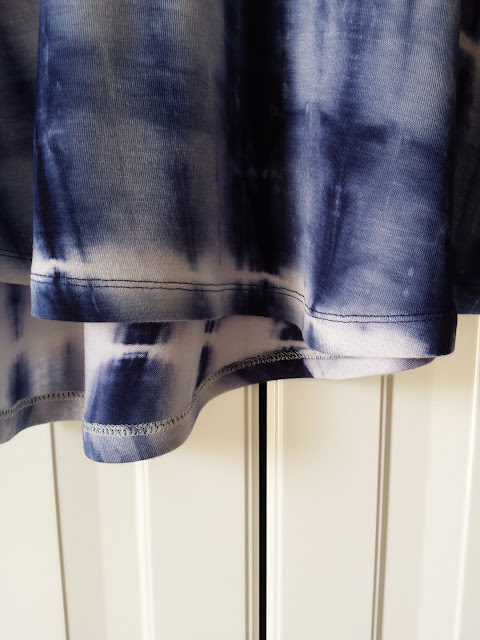 If you have ever sewn with knits, particularly the lightweight variety, then you probably know that hemming them with good result can be tricky! There are those who are lucky enough to have a coverstitch machine included in their arsenal. Someday I hope to be one of those lucky ones... But for now, my Bernina 350 and my double needle and I seem to get along just fine. Today I'm going to show you the method that I use. 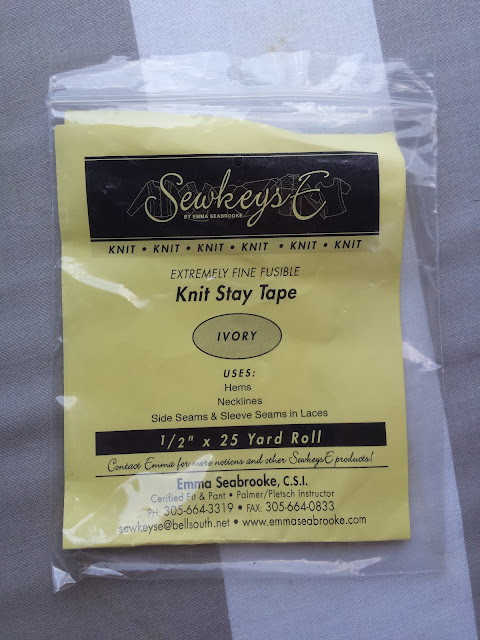 The tools I use are, my walking foot, my double needle, Sewskeys Fusible Knit Stay Tape, regular thread (I don't use wooly nylon), and a little tweaking to my tension and stitch length. So to start, fix your machine with a walking foot if you have one. If you don't, I can't recommend it enough for lightweight, slinky knits. Then install your double needle. I have had the best luck with THIS size (2,5/75 - in the photo) on lighter knits. Some thicker knits might take a larger needle (4,0/75) a little better. Just play around on some scraps and find which works better for you. 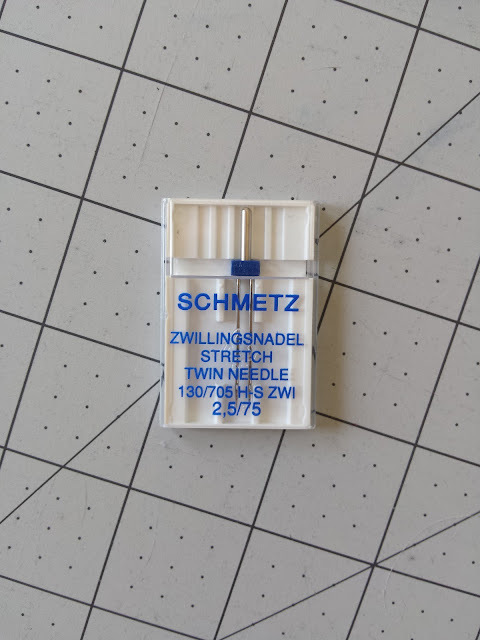 *UPDATE: The 2,5/75 Stretch Twin Needle is also available HERE! 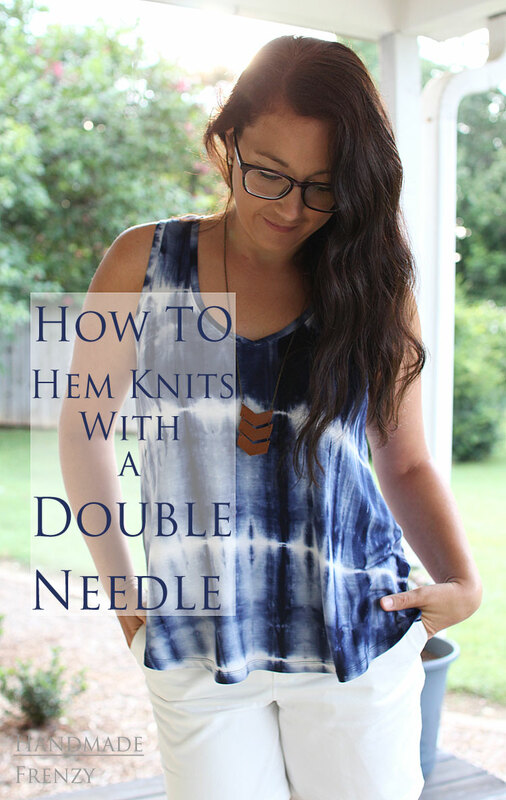 **NOTE: Make sure the double needle you are using says STRETCH. This makes all the difference! Next, I adjust my tension by lowering it slightly. My machine is typically at 4, I lower it to around 3. Then adjust your stitch length to slightly longer. My machine is digital and is set at 2.5mm, I bump it up by 3 notches to 3mm. Next you'll want to prepare your fabric. 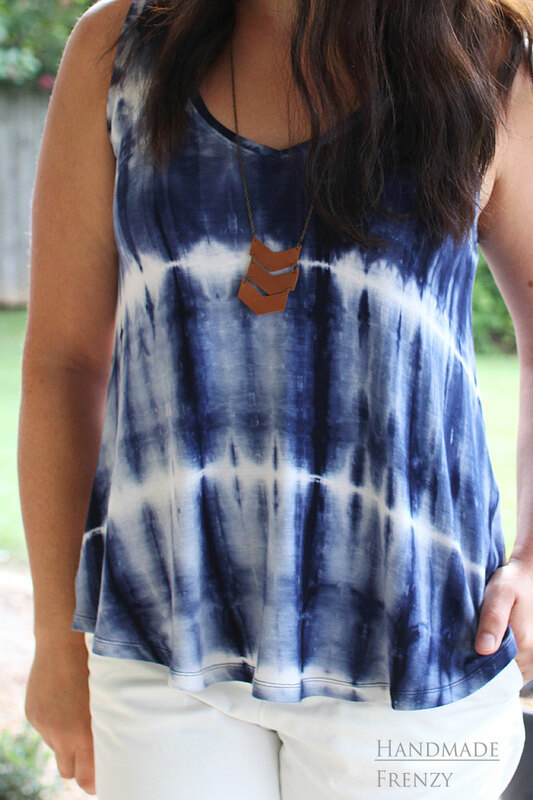 To do this, I serge the bottom edge of the hem. This is super important because it stabilizes the edge and gives something with some heft for the double needle to sew on top of later on. 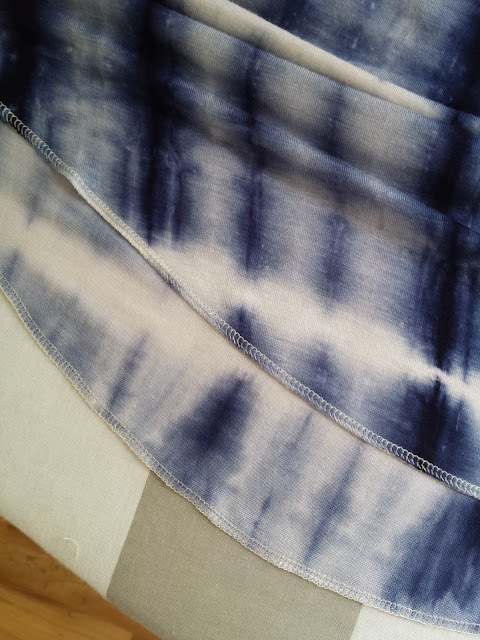 If you don't have a serger, you may want to try applying the stay tape to the very edge and folding under 1/4", then your remaining hem allowance to give some good stability to the edge that will be sewn on top of. 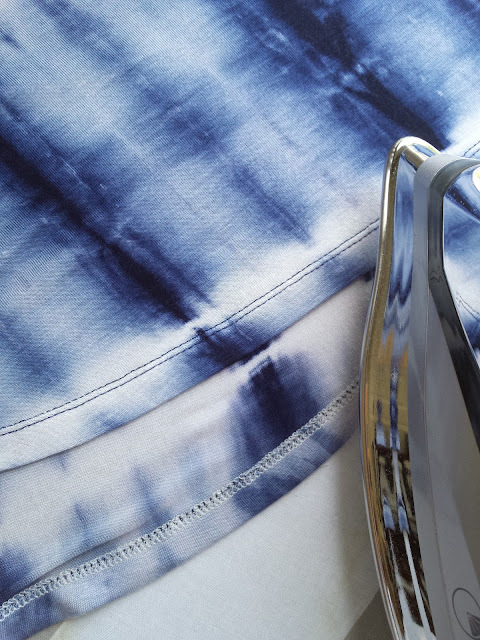 *Serger tip: For lighter weight fabrics, it may be necessary to adjust your differential. Check your manual on how to do this. 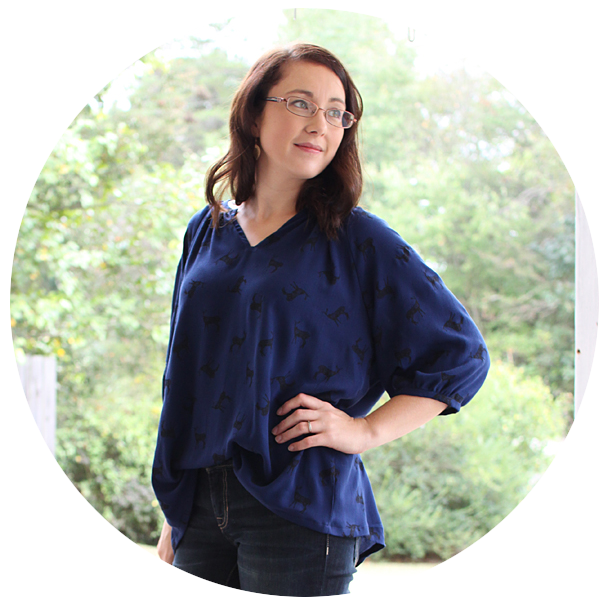 On my serger, lightweight knits are a lower number than heavier knits. I have a little cheat sheet where I jot down the differential number for different types of knit, and then test each knit on a scrap before starting the project. Next, apply the fusible stay tape. I use the 1/2" wide variety, but it comes in several different sizes! I apply it by lightly pressing with moderate heat and some steam. Next fold up the edge of your hem and press well. The stay tape provides a really nice guide for this! Now we go to the machine and stitch! I like to use my fingers to feel the serged edge and make sure that the double needle is sewing right on top of this. Try not to let one side of the needle fall off the side of the serged edge as this can cause the dreaded tunneling. 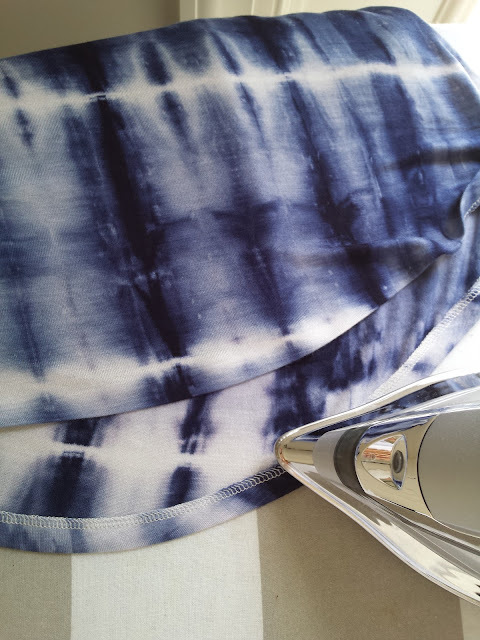 Give your hem a final steam press and then admire your work!! 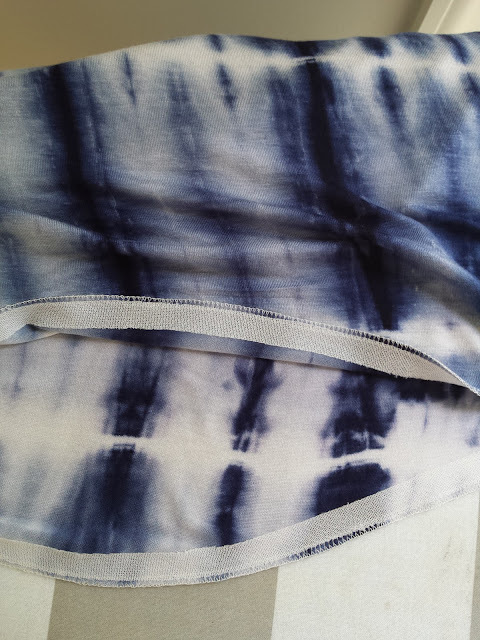 **NOTE: This method works great with lighter and slinkier knits such as rayon spandex (shown). If you are using a heavier, more stable knit, such as ponte, for example, you will probably be able to get away with just a serged edge or just the stay tape. ***This post is not sponsored or affiliated, I just happen to love these products and use them all the time. Just sharing the love! Thanks for reading! I hope this was helpful for you! Thanks for sharing. I have avoided the double needle. Where do you find the stretch ones? I haven't seen them at JoAnn where I usually pick up my supplies. thanks! There is a link in the post to where I buy them on Amazon. I haven't found them at Joann either. I just stock up online occasionally, they are worth it!